B: Paul Russell: What Was He Thinking? Paul Russell: What Was He Thinking? Paul Russell is a freelance sub-editor and writer based in Dorset, England. More of his photography can be seen here. "I live in quite a rural location and my photography usually involves getting on the train to somewhere a bit busier and then walking around for 4 or 5 hours looking for things to photograph. I’m a pretty light shooter, and it’s not unusual for me to wander around for several hours without taking a single shot. I find this quite frustrating! Often I will take one photo that I think is OK and that seems to open a (small) floodgate – suddenly there are a lot more pictures around than there were a few minutes ago. If this happens early in the day, it usually turns out to be a good session. On the other hand, if the day is drawing to a close without much success, self-doubt starts to creep in and I begin to wonder if my day will be wasted. On these occasions I try to gee myself up by reminding myself that a good photo can come in an instant and doesn’t depend on what’s happened before. As the football manager Brian Clough was fond of saying, ‘it only takes a second to score a goal’. I had been meandering around without much luck for 4 hours when this scene presented itself. The women seemed to be moving in slow motion and it was one of those photos that just falls into your hands. Then all you have to do is keep a clear head and point the camera in the right direction. The ladies are standing in front of a construction site and the graphic on the wall is the artist’s impression of the finished building." 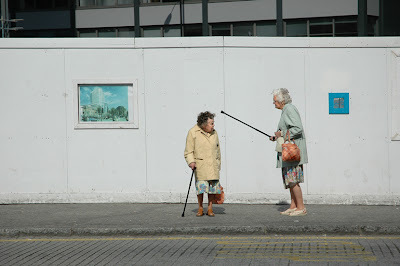 "This photo was taken in Bournemouth in 2007 on the last day of the Labour party conference. The autumn seafront was largely deserted, apart from dozens and dozens of police desperately looking for something to do. People photography clearly wasn’t an option without enduring a subsequent lengthy interrogation, and I wasn’t in the mood for that. Wandering down to the end of the empty pier I spotted this scene. 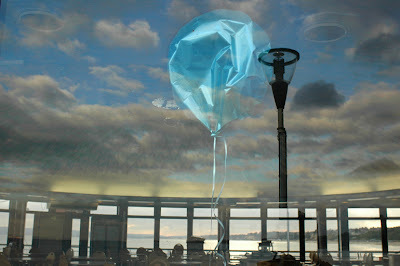 The café was closed and a solitary balloon was floating against the glass window. The rest of the photo is a confusing mixture of reflections. What was I thinking? Well, it was probably a mixture of curiosity and the usual indecision that strikes me on the rare occasions that I take a non-peopled shot...The café has been refurbished since – the distinctive ‘fish scale’ ceiling remains but the glitterball to the left of the balloon was consigned to the skip – presumably deemed too gaudy for the new upmarket restaurant." "I frequently photograph country shows and dog shows and it’s a very different experience from more traditional street photography, as there are plenty of other people with cameras around. As photography is seen as a normal activity in these situations, the heart-in-mouth sensation that often goes with traditional street photography is absent – for better or worse. I find country shows fascinating as there’s a mixture of classes and characters that I don’t usually bump into elsewhere, and I’m on the lookout for the sort of pictures that wouldn’t end up in the local papers. 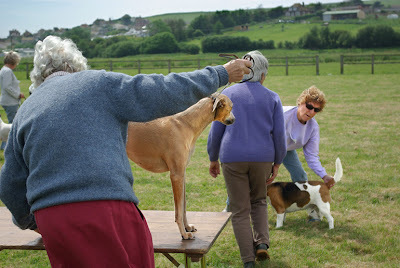 I had taken a few shots of the judging and was moving around trying to get a good position while talking to a woman to the left of me who was asking loads of questions (Was I a professional? Had I taken a picture of her friend’s dog? Could I send her a copy? Oh, what was my address?). I was pleased to keep my concentration until the scene fell into place!" "The problem with these sort of events is that they are naturally quite spectacular, and so it’s easy to take a good ‘record’ shot, but I was looking for some added human interest in the frame. I used old manual-focus film cameras for many years but since turning to digital in 2003 I’ve tended to rely on autofocus. As the scene was unfolding in front of me, luckily I remembered that manual focus still existed, as I wanted the focus to stretch back from the man in the red jacket in the right-hand corner. I focused to 2 metres and waited a few seconds. As the woman kicked the ball I took the photo. 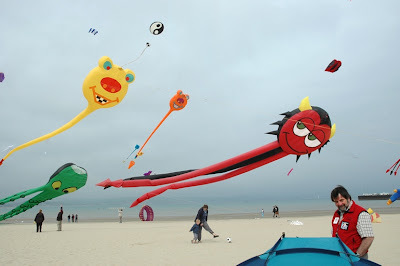 I had dialled in an aperture of f/11, which proved to be just enough to get the big red and yellow kites in focus." 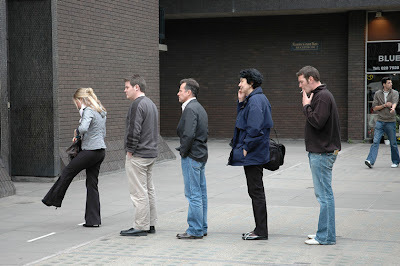 "People on their lunch break queuing for a cash till. London is one of my favourite photographic locations, but it is quite a lengthy commute for me so I can’t make it up that often. And when I do, I tend to tear around like a headless chicken looking for photos before the light goes. As there are so many photographic possibilities in London, it sometimes can be hard for me to slow down and really look at what’s going on. What initially caught my eye here was the similar amount of personal space that each protagonist had created. I took a few shots of the queue, and as the woman fished around in her bag she kicked up her leg, which completed the scene." "Sometimes I’m inspired by music that’s running through my head – maybe just the mood it creates or specific lyrics. 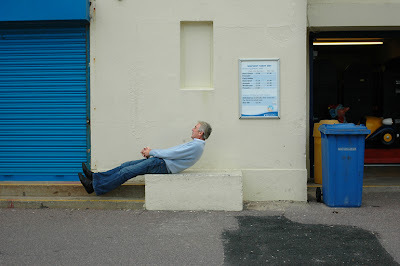 This photo is loosely inspired by the Bob Dylan song ‘Tangled Up In Blue’ and the effect that taking painting classes with Norman Raeben had on Dylan’s songwriting. Over to Bob: ‘I was just trying to make it [Tangled Up In Blue] like a painting where you can see the different parts but then you also see the whole of it. With that particular song, that’s what I was trying to do ... with the concept of time, and the way the characters change from the first person to the third person, and you’re never quite sure if the third person is talking or the first person is talking. But as you look at the whole thing, it really doesn’t matter.’ That phrase about the first and third persons seems appropriate to the whole of photography for me – how much of the photographer is in the image, and how much is passive recording of what’s going on around you? My intention with a photo like this is to try and imply several separate stories, with single characters or groupings of characters and where it’s not entirely clear what the relationship is between them all. (And in this case, in a few minutes’ time, a whole new set of characters will be here, coming off the boat.) I was aiming for a sort of ambiguity and otherworldly feel that I got from Dylan’s song where the lyrics seem to dissolve time. There are elements of the lyrics of the song present as well, such as the red hair. The boy’s poise seems unnatural and stiff – that’s just how I caught him – I like the fact that he looks slightly artificial. 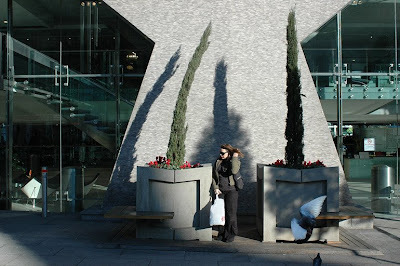 If that all sounds quite pretentious, often when I take a photo I’m just thinking ‘that looks nice’..."
"This was taken in front of the Centre Point Tower at the junction of Oxford Street and Charing Cross Road in 2008. I noticed the interesting light and shadows first. The woman immediately moved into position and stood there (one shot), played with her hair (second shot – this one) and then, inevitably, got out her phone (third shot). The pigeon was a stroke of luck. I never hang around in one spot for more than a few seconds – I’m far too impatient and immediately sense that there are probably better pictures to be had elsewhere. I don’t have any favourite London locations or spots – above all, I like to be surprised and finding new backgrounds is half of the fun. As I left this particular scene I noticed a man with a great technique quite obviously ‘doing’ street photography on Oxford Street – London is the only place I’ve ever noticed street photographers in action. I took over 100 photos that day which is a huge number for me, and I do remember it as being one of those rare days when there seemed to be pictures everywhere." "This is a complete contrast to the London shots, where the problem for me is filtering down the sensory overload to something manageable. I have walked along this seafront dozens, maybe hundreds, of times and I know every inch of the physical terrain. Hence on out-of-season days I often walk round in a state of semi-boredom. What I am looking for on those occasions is a chance event, an element of physical change, or a blip in normality to relieve my boredom! In this case the man in the picture was fooling around for the benefit of a young relative just out of the frame..."
I know you're not looking for validation here, but numbers 1, 5, 6, and 8... are truly wonderful images. Agreed. I've been a fan of No.6 for a while - a stunning picture. Nice to see Paul getting deserved recognition. print arrived today, Blake. It looks great - many thanks! But will it fit in a back pocket?